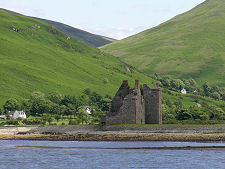 Lochranza Castle enjoys a superb location on a spit of land projecting out into Loch Ranza from its south west side. As a result it provides a focal point for much of the village of Lochranza as it wraps around the loch, and features in many views of different parts of the village. The castle you see today looks to be a fairly typical L-plan tower house with a single small entrance facing west towards the land access from the village along the spit. 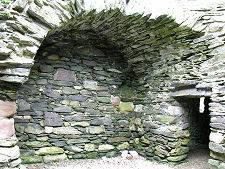 Internally the ruin has three distinct parts. 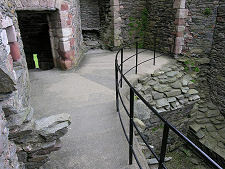 The main block of the castle was divided in two, with the south end providing a single large room on each of three floors. The north end provided rather smaller rooms on its four levels. At first floor level the floor in the south end of the castle has long gone, but this would have been the castle's great hall, while the first floor of the north end was home to the kitchen. 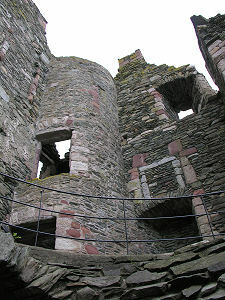 The third main element of the castle is its tower, attached to the west side of the south end and originally standing five storeys high. 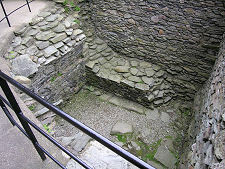 Today it is possible to access the ground and part of the first floor of the north end of the castle and the ground floor of the south end. 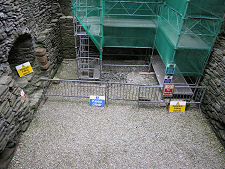 The south wall of the castle and the tower were undergoing consolidation work when the images on this page were taken. 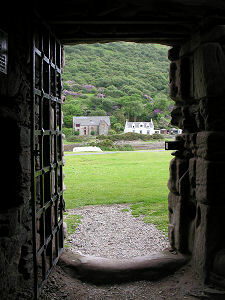 Although Lochranza Castle looks typical of many others, looks can be deceiving. The castle that was originally built in the 1200s for the MacSweens was of an unusual hallhouse design, comprising a two storey oblong building with storage on the ground floor and a hall and private chambers above. The "back door" was on the south wall of the hallhouse, while a second door at first floor level on the north side gave direct access into the hall from a wooden forestair which could be removed in time of attack. 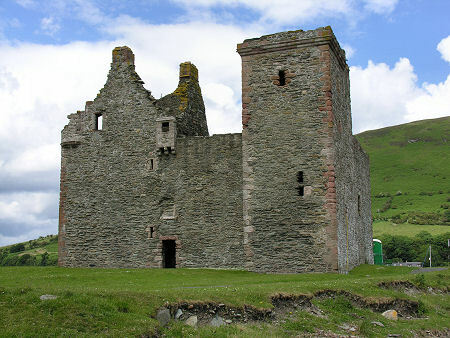 The MacSweens were a powerful family during the struggle for control of the western seaboard between Scottish and Norwegian kings, and had a very similar castle at Skipness, on the other side of the Kilbrannan Sound in Argyll. But when the claims of the Norwegians were finally relinquished in 1266, Alexander III sought to strengthen his control over this part of his kingdom by granting land and property to loyal supporters. As part of this process he granted Lochranza Castle to Walter Stewart, the Earl of Menteith. 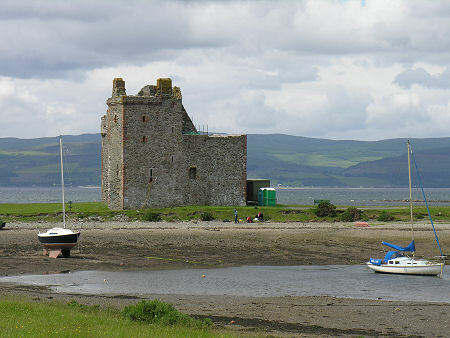 In 1306 Lochranza Castle is said to have been the spot at which Robert the Bruce landed on his return from Ireland, en route to his successful bid for the Scottish Crown. It was certainly in the possession of his grandson when he became King Robert II of Scotland in 1371. It subsequently saw use as a royal hunting lodge. 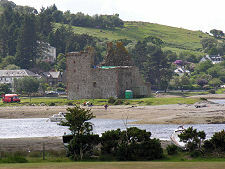 Several further changes of ownership followed, during which Lochranza Castle gradually became transformed from a hallhouse into the tower house we see today. During the 1490s it was used as a base from which James IV could attack the Lords of the Isles, and Cromwell's troops occupied it in the 1650s. Then, following the foreclosure of a mortgage, it found its way in 1705 into the hands of the Hamilton family, like so much else on Arran. The castle has been disused since the end of the 1700s and today it is cared for by Historic Environment Scotland. We have heard it claimed that Lochranza Castle has literary connections, apparently being used as the basis for the castle in the Tintin adventure "The Black Island". Fans of Hergé will have to decide for themselves.